Although Buddy’s actions are preconfigured, this doesn’t mean it gives you any less control over your workflow. In fact, each action can be fully modified, allowing you to change the Docker image, install packages required by your app, attach databases, and so on. 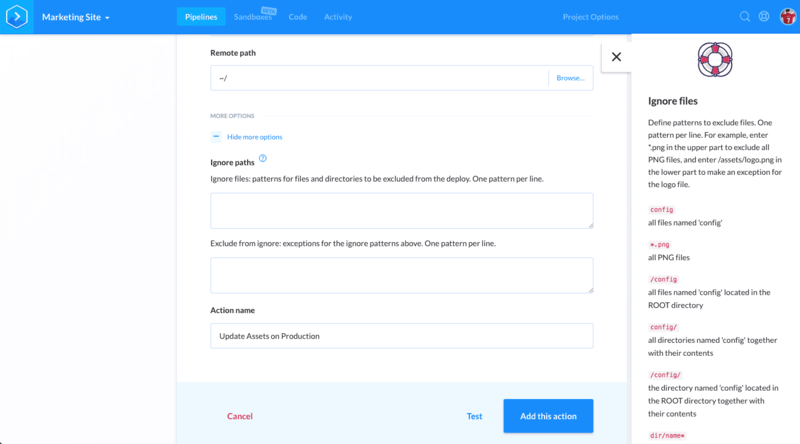 In case of deployment actions, you can select source and remote paths, select the revision on the server so that you don’t have to upload everything from scratch, but also use ignore patterns to exclude files from upload. Let’s have a closer look at that last feature now. Here we have a repository with multiple directories, but we only want to deploy from two of them. Until now, this could be achieved with two deployment actions and setting an individual source path for each. However, this wasn’t possible for AWS Elastic Beanstalk and Deployment to Lambda actions.